Aside from this brand, I also own a few from Elianto, L'oreal, LA Colors, ELF, etc..
Dollymix - my favorite among the 5. Really gives me a nice flush. This looks scary on the pan, but the key in applying this is to use a kabuki brush or duo fibre brush so that it will not look too harsh on fair skintones. Save: Everbilena blush in Shy. I had this before, but gave it away coz the color looks kinda similar but the Dollymix is pigmented compared to EB. Springsheen - gives warmth on my face. The color is a subtle bronzey-peach on my skintone with a hint of shimmers. 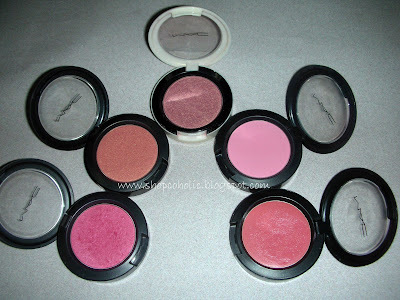 Afterdusk - my fave blush to use during nighttime coz of its shimmers. I layer this with any pink blush. 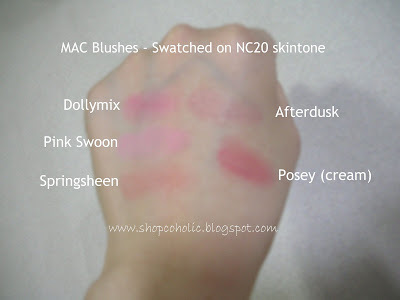 When used alone, its really hard to get the color to show up on my skin and its not that long lasting compared my to other MAC blushes. Pink Swoon - A no-brainer blush. Gives a subtle baby pink flush that compliments blue, green or smokey eyeshadows. I read Kim Kardashian is a fan of this blush! Hope you like my review.. See ya next time! 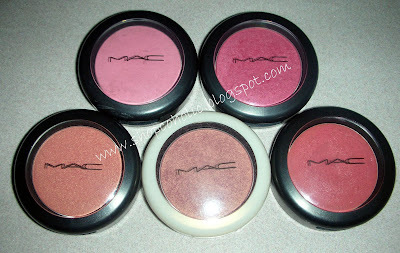 you do have a lot of MAC blushes! thanks for the swatch! i only have one blush! haha. the dollymix and pink swoon looks nice. @ askmewhats & my_makeup_mania - thanks lovelies! @beauty junkee - oo nga! i read in Makeupalley that its a must have shade! cge ill try dessert rose next time! thanks..
@crystal - yeah i think the colors looks nice on you too!